Q. What type of hair care products do you use? A. We provide excellent brand-name hair care products and accessories from Aquage, Matrix, Sleek Look, Biolage, Vavoom, Essentials, SexyHair, Marocccanoil, and more. Q. What type of skin care products do you use? A. We use the Pharmagel product line. It is one of the best Anti-Aging products for skin on the market today. We also retail all Pharmagel products. Q. Do you provide services for men, too? A. Yes. We actually get many male customers. A. Yes. Gift certificates are a big part of our business. Usually our regular customers use them to get their significant others in to be pampered. A. 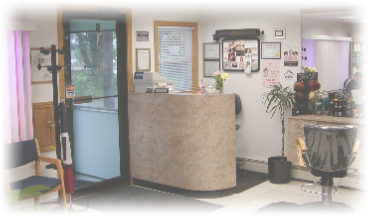 We do take walk-ins, but to minimize any possible wait time ... and get you in and out quickly ... we suggest that you make an appointment when possible by calling (508) 481-5525. A. Your friend was right. Please check out our Services Page by clicking here. Q. Do you have a list of services and pricing online? A. Yes. You can view pricing by visiting our Services Page or you can click here.